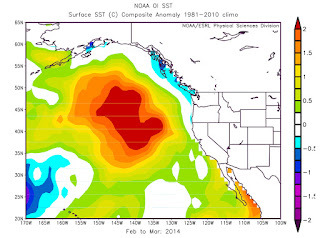 Cliff Mass Weather and Climate Blog: Godzilla El Nino Versus The BLOB: Who Will Win? 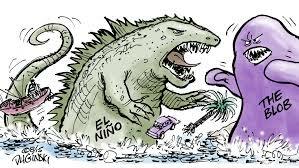 Godzilla El Nino Versus The BLOB: Who Will Win? Environmental monster match-ups are familiar to many of you. 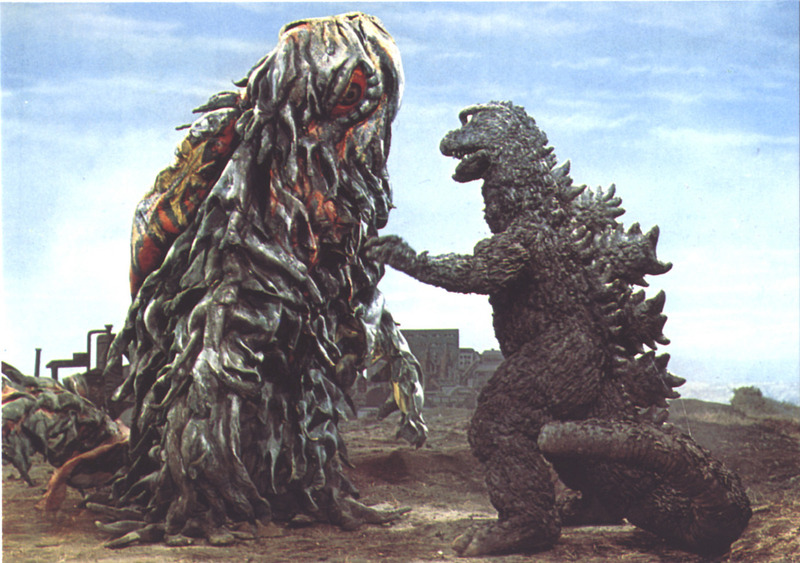 For example, who could forget Godzilla versus Hedorah, The Smog Monster? OK, let's deal with the big question. Will Godzilla El Nino and the BLOB battle each other? Or will they combine forces to produce the warmest period in NW history? Or the stormiest? Much is riding on this conflict and this blog will consider the potential outcome. On one hand, one of the strongest El Ninos in decades is developing, the Godzilla El Nino. NOAA is so sure about its effects this winter that it is going for a 90% chance of a strong El Nino, which would make the Northwest warmer than normal, slightly drier than normal, with roughly 20-30% less snowpack than normal in the mountains. El Ninos are associated with warmer than normal water in the central/eastern tropical Pacific and along our immediate coast. Then there is the BLOB, the name affectionately given to an area of warm warm over the northeast Pacific. There is strong evidence that the BLOB has warmed surface temperatures over the Northwest by 2-4C over the past year, contributing to our record high temperatures and lack of snow. Together, will they destroy Northwest snow and normal weather? Bring another torrid winter in our region? Terminate our ski industry? I suspect I know what will happen. They will NOT combine forces. They will fight, and one will win. 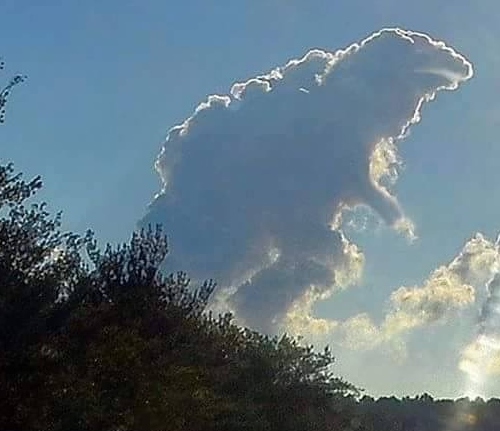 Just like in the movies, Godzilla will become our ally. 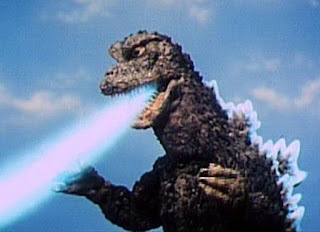 And it makes sense that the mighty Godzilla will prevail. The BLOB, as documented in a nice paper by State Climatologist Nick Bond and colleagues was the stepchild of a huge area of high pressure along and east of the West Coast of the U.S. High pressure resulted in less wind and mixing of the upper ocean layers, leading to reducing mixing of cooler sub-surface water to the surface. Thus, the ocean surface was warmer than normal. The anomalous high pressure also resulted in less movement of cooler Pacific waters from the north. Weaker cold advection in technical terms. Here is an example of the sea surface temperature (actually the difference from normal, or the anomaly) associated with the BLOB. BLOB is warm. But now El Nino is forming...and not just any El Nino...a SUPER GODZILLA El Nino. The warm waters over the central and eastern tropical Pacific associated with El Nino have a big impact on the global atmosphere, alternating the global circulation. Let me show you. Here is the typical sea level pressure anomaly associated with El Nino (the difference of pressure from normal). Pressures are LOWER THAN NORMAL over the eastern Pacific (purple colors). A BLOB KILLER. Why? Because it is exactly opposite of the pattern that produced the BLOB--- high pressure in the same area. What do our latest seasonal forecast models predict? Let me show you. Here is the predicted sea surface temperatures for this winter. A narrow zone of warm water immediately off our coast (which is typical of El Ninos), but no BLOB. In fact, cooler than normal waters offshore. You can see the very warm water over the central and eastern tropical Pacific...a sign of a powerful El Nino. We are already seeing evidence of these changes. The water in the central Pacific is cooling. The ridge of high pressure over us has weakened and high pressure has established itself over the central Pacific. Precipitation is increasing over our area. The BLOB is vulnerable. And I believe that Godzilla El Nino will destroy it. Nature is cruel. What does that mean for our weather? A strong El Nino bring modestly warmer than normal temperatures, with a snowpack about 20% below normal. Much better than last winter. The correlation with Northwest precipitation is weak. Less lowland snow and fewer major storms. Enhanced precipitation over southern/central California. In short, far more normal conditions than the weird weather we have experienced during the last year. 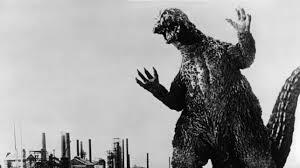 Our region should rejoice in Godzilla El Nino's strength. 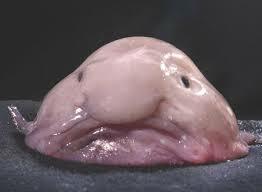 But deep down we will be sad for the vanquished BLOB. I so hope that you are right! Aside from the damaging windstorm, this past week has been wonderful. Has this pattern ever happened before?? It will be very interesting to see the outcome for future reference. Cliff, with the predicted SST anomaly around Hawaii being colder than normal, would that imply less chance of atmospheric river events hitting our region? Rick, What does PDO mean? 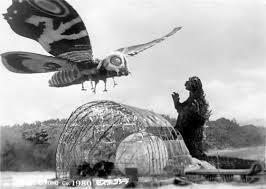 Darn it, I was hoping they'd combine forces, so we'd start hearing about Blobzilla. Or El Blobbo. I shall rejoice at the blob's demise! El Nino has a strong positive impact on the number of hurricanes in the Central Pacific. We are seeing this effect right now, with 3 major hurricanes appearing simultaneously in the C/E Pacific for the first time in recorded history. The effect? Because remnants of such hurricanes are driven NE and then E around the periphery of the N Pacific gyre, said remnants end up in Alaska and the Pac NW. This additional heat energy could easily sustain the Blob for a few months longer. Coupled with even more excess heat energy put into the system by the Blob, you get the sort of anomalous low pressure system we saw over the weekend. Note also the sweep in of relatively cooler air that has followed it. They expecting snow above 5000' in the Cascades and it is only early September! In summary, I don't think it is a foregone conclusion that the warm and dry prediction will be correct. Something different is at play this year than in typical strong El Nino years. Thanks for the clarification. I came here from the komo4 article wondering why 2 warms equal a cold. Your explanation makes perfect sense. Thanks Cliff! I hope you are right. I've enjoyed the nice weather but couldn't handle another ski season like last year. 2016-17 Should be a great ski year if it follows what happened after the 98 super El Nino. Once the heat is discharged we should get some cold winters again. Snow? You've gotta be BLOBbin' me! 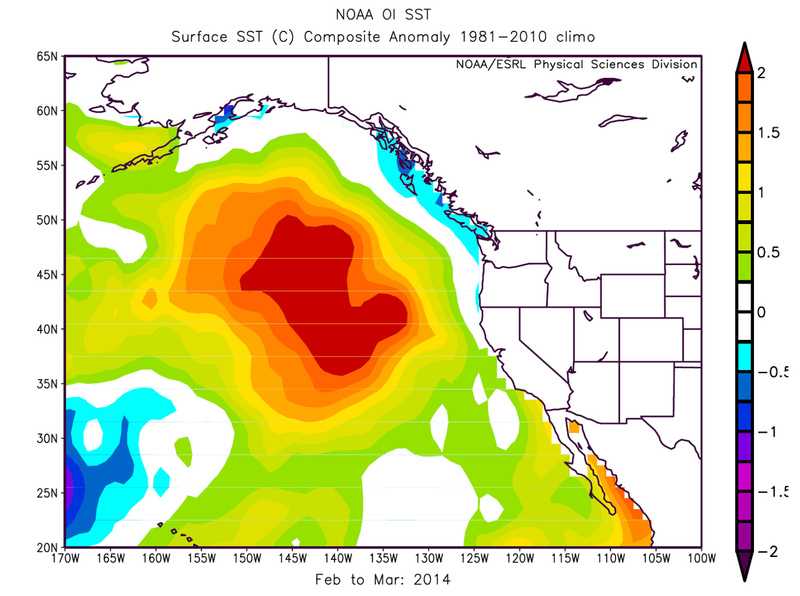 In the NOAA SST map, there's still a lot of warm water right offshore, if not exactly a Blob. I'll bet the salmon don't like it! Based on the scale on that chart, we are talking maybe 2C warmer water than usual along our coast. Given coastal water is usually in the high 40's to low 50's (F), I don't think the salmon will care. They don't like 60's and up. 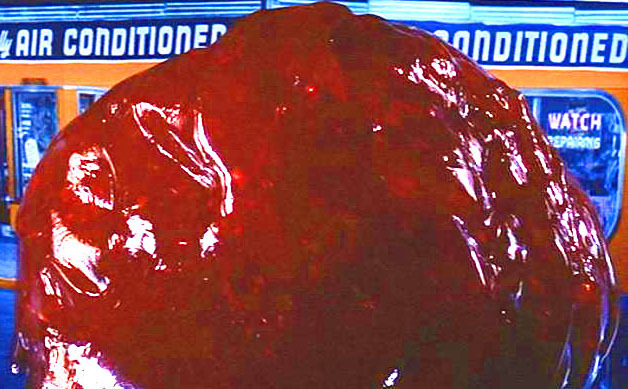 Great news that the Blob may die. I'm no fan of his idea of weather. Here's hoping some of the remnants of those hurricanes and typhoons in the Pacific come our way. I love a good windstorm, or two, or three! Minus the fatalities! As I understand it, the PDO has a less dramatic climate effect than the El Nino Season Oscillation - around 1/2 degree Celsius average sea surface temperature anomaly instead of 1-2 degrees Celsius. Rick might still have a point though. As I understand it, the PDO and ENSO have some degree of interaction. Actually, it seems to me that since both relate to sea surface temperatures, maybe we should be talking not so much about a super El Nino, but rather a strong El Nino on top of a positive PDO phase. Of course these are just predictions. Last weekends storm was supposed to put an end to the fire season. But it didn't. So ya know, take it with a grain of salt. 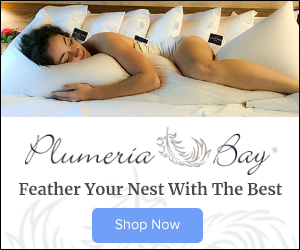 Who predicted the storms would end fire season? When the vegetation is dry, an active fire can keep burning through quite a bit of rain. And when you throw in the Eastern Washington rain shadow, it becomes obvious that you can't reliably expect a late summer storm or two to modestly slow down the spread of active fires. My understanding is that the Paradise fire (SW Olympics) received 7 inches of rain, and the fire management folks still believe its alive, smoldering in the undercover, waiting to grow. If September isn't really wet, it might regain strength. I presume eastern WA fires (due to far less dense fuels) would take far less rain to put out, but they didn't get much out of these storms. Mostly increased humidity and cooler temps, which helps. Likely we'll be into November before the fire season ends completely. As per normal. Rainy season doesn't officially begin until mid-October.Best we can hope for is that we're past the worst of it. So we are to expect a warmer and drier winter than normal? We drove the North Cascades highway from Winthrop yesterday. In spite of the rain, we observed 3 small columns of smoke still rising from the Goodell creek fire. I live in Winthrop and this morning I can see a bit of smoke at the south end of the Methow valley. Its likely from the Black Canyon fire. But the fires are very much reduced, the smoke is gone and we feel safe again. According to the Winthrop weather station we got a pathetic amount of rain (storm total of 0.05-in). This week has featured some very nice, crisp, late summer/early fall days. I hope you are wrong. I'm so done with this weather. I adore snow. Would love to see the mountains get dumped on. Looks like snow flurries at Sunrise on Rainier right now. Normal weather at last! That's one of the funniest blog posts Cliff. LOL. Thank you! The current El Nino is being compared to the 1997 major El Nino, only with a hotter N. Pacific. Usually we would be warmer and drier and southern CA would get bashed during two of their four seasons: rain, mudslide. (The other two are fire and earthquake.) All bets are off this year. I guess I just don't completely agree with Cliff. The PDO is strengthening on the positive side, and this El Nino episode is on a scale that we see very rarely. My amateur-ish opinion is 1) I'm not convinced that the blob is going completely away, and 2) Because this El Nino is so far off the map in terms of historical precedence I'm willing to say the effects might be something we had no expectation of. I'll jump in now and say summer of 2016 in western Washington will be (slightly) above normal temps and same for precip. But another repeat of 2015? I hope not. I love hot summers in the PNW, but that was too much.. It's been a incredible summer for extreme heat in Europe, with Germany setting its all-time heat record (twice), and with hundreds of stations having long periods of record setting all-time heat records. The heat has been responsible for hundreds of heat deaths in Europe, and according to the August 2015 Catastrophe Report from insurance broker Aon Benfield, drought in Romania, Poland, and the Czech Republic this summer has cost at least $2.7 billion--just below the $3 billion price tag of the California drought. 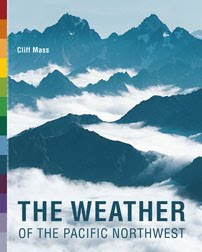 All-time September heat records were smashed at individual stations in many other countries, including Russia, Romania, Bulgaria, Serbia, Montenegro, Macedonia, Kosovo, Bosnia and Herzegovina, Croatia, Slovenia, Italy, San Marino, Hungary, and Germany, with 48 stations in Germany alone setting new all-time September heat records (thanks go to Dr. Michael Theusner for this stat.) Some stations with more than a century of data even managed to beat their ABSOLUTE records for any month. Great art humor and theory. Fun and fascinating. always followed along with your blog and Friday KPLZ musings on weather. hard to believe you support keeping the alaskan way viaduct standing? hope I am wrong. Seattle is moving on. a city needs to be connected to its waterfront. the viaduct was a mistake 50 plus years ago. that was a time when no one cared about waterfronts and the city closed up after work hours. the viaduct is not a place for a park, it is not a giant planter box.... it is an obsolete poorly engineered structure that has long outlived its purpose. So the blob may be temporarily eased by a weather pattern such as El Nino. That's a nice stay of execution. The RRR (the Ridiculously Resilient Ridge) is generally thought to be forming as a result of shrinking ice cover in the arctic. As temperatures continue to climb world-wide, we certainly will not see any slowing in ice loss. That means the RRR will either persist or come back after a brief hiatus, right? Since it is this high pressure ridge which created the Blob in the first place, we'll see the Blob return as well. Still, I intend to enjoy the rain's return to the max, while we have it. Drought in 2016 for Washington State?